You are currently browsing the category archive for the ‘Constance Nzeneu’ category. In response to poverty, persecution , war and climate change, people are on the move all around the world. In the UK the right of asylum is under constant attack, with regular dawn raids, overcrowded detention centres and increasing numbers of deportations to places the government knows are unsafe. Come and hear first hand accounts of contending with British border controls from local asylum seekers BB and Constance Nzeneu. Others with a story to tell about their own experiences very welcome to contribute. Followed by a discussion and practical advice on resistance to the UK Border regime. 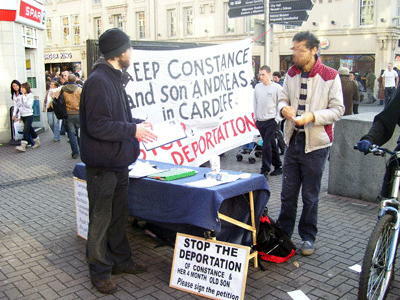 No Borders South Wales supports Constance Nzeneu in her campaign against the forced deportation of her and her son Andreas from Cardiff to Cameroon. 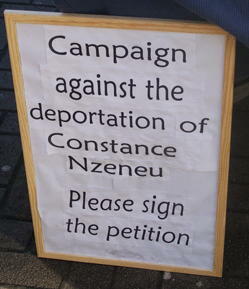 Please see our campaign page for more information and to find out how you can help in her fight against deportation. Constance Nzeneu & her 5 month old son Andreas face imminent deportation to Cameroon following the Home Office’s rejection of her asylum claim. Constance fled Cameroon over two years ago when her father tried to force her into an arranged marriage which would have meant undergoing Female Genital Mutilation, which is widespread there. When Constance refused him, the ‘fiancee’ took her to court. Knowing she would lose, Constance left her family home. A search warrant was issued, involving the police. Her father also put an announcement in a national newspaper offering a reward to anyone who returned her to the family because if the marriage didn’t go ahead they would owe the ‘fiancee’ the dowry money & be shamed within the community. Constance faces a dangerous & uncertain future if she is forcibly deported to Cameroon. There will be recriminations from the police, the court, the ‘fiancee’ & her family. 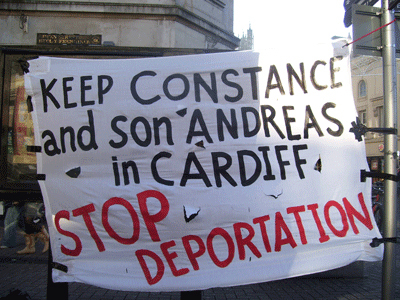 Constance has said she will fight until she & her son Andreas, who was born in the UK, are allowed to stay. Constance’s case is not unique. The UK government, which prides itself on its supposed humanitarian character, arbitrarily deports tens of thousands of people every year, back to places where they face persecution, torture & often murder, all in the name of ‘managed migration’.